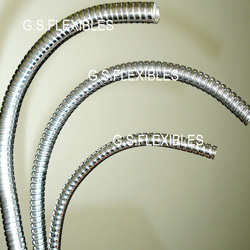 Gooseneck or Double Interlocked Stayput type is fixable type of Flexible tube. It can be bent into any shape. It has maximum crush resistance and higher bending radius offers protection against accidental bending. Thus is most suitable for applications such as protection of fiber optics and armor to capillary in Temperature Gauges and Controllers.